Speaking of pumpkins, Mike. 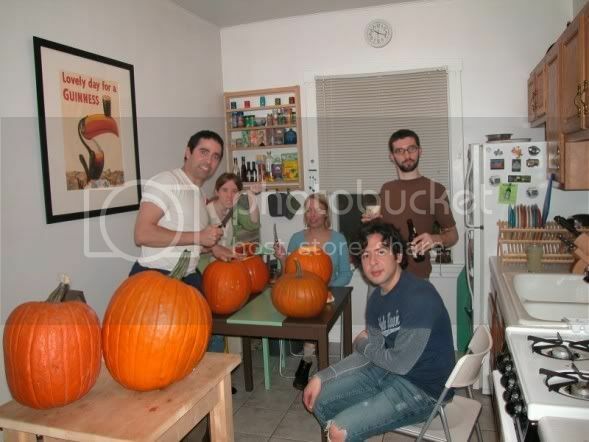 . . Just like the Rockers, we too had a pumpkin carving gathering. 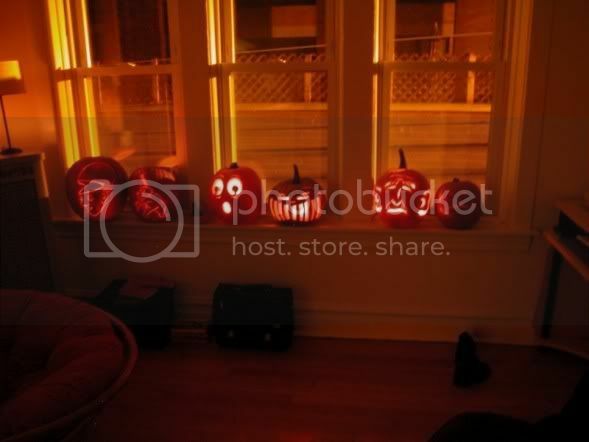 We had some of the best pumkins I've seen this year, including Reba's George Bush pumpkin - see if you can find it in the group picture. Matt and I did illustrations from Shell Silverstein's a Light in the Attic. I loved this book as a child, and you never really realize how creepy his illustrations are until you look at them again as an adult. I have some minor finishing touches on my pumpkin, so I'll post those pics later. Here's the group before the carving starts.
. . . and the artists! It's 2:39 in the morning, and I'm logging in to say that I'm making a "Breakdancing Gene Shalit" pumpkin for our annual pumpkin decorating contest at work. That is all. I don't have a lot of time to write lately. I've been too busy. 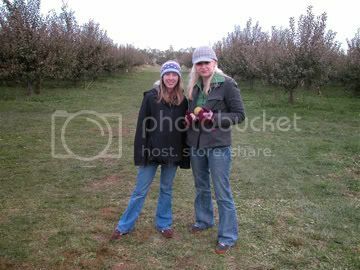 Here are some pics from Sunday when Christie, Matt and I managed to get in some apple picking time. Enjoy! Here is Christie enjoying a delicious apple. Yes, Matt does look like a mountain man. 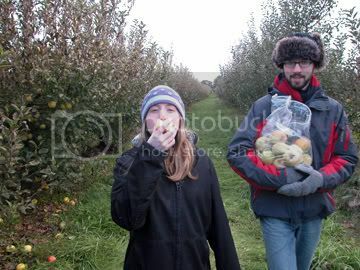 For some reason, every time we pick apples, we always talk about how the bag they give us looks so small and that we should get more apples for our money. We always shove our pockets full of apples. Christie and I with our pockets full. I love this picture. 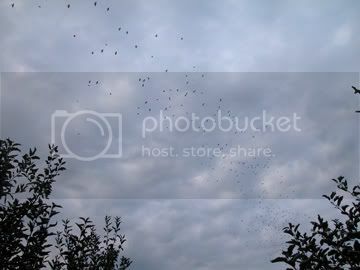 There were swarms of birds overhead, and this is the best one I could get. Yesterday, I spent perhaps the funniest $1.25 of my life. Okay, maybe not of my life, but definitely this month. I was out in Indidana yesterday to celebrate the birthday's of Adam, as well as Dawn and Mia (Matt's family), when we stopped off at this store called "Halloween USA." I love Halloween, and a store like this is like Disney World to me. 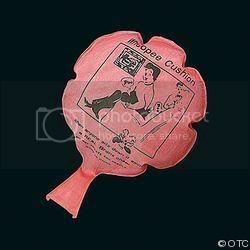 Anyway, I stumbled upon the joke and trick section where this little number (ahem, the whoopee cushion) was stashed. During the ride home, I tried to figure out where I could put it so Matt would sit on it. I could only figure out that he'd probably be going to sleep soon, so I put it under his pillow. Anyway, you slice it, it worked and I thought it was hilarious. Of course, Matt warned me that he would get me back. Ahh, the game of sweet revenge (Sorry!?). Sadly enough, this is not the first Whoopee Cushion I have ever owned. Thinking back, I believe this is probably the 5th or 6th one I've owned. Where do all my lost Whoopee Cusions go? On a another note, I just bought the new Cursive (Happy Hollow) and it rocks. LOVE IT. Also saw the 3D movie, Monster House, yesterday. Ususally, movies like that compromise plot for effects, but I felt that this was a pretty solid movie all around. The animation was amazing. Summer is offically over. Yes, I know it was over a week ago, but I'm a little behind. It's crazy; I had a list of things I wanted to do when it was spring, and somehow managed to do only a handful of them during our summer months. Here is my list of things I wanted to do, but didn't. 1) Go camping. June 2005, Matt, myself, and a bunch of our good friends in LA spent the weekend up in the mountains. We hiked, crossed a stream in my Jeep and cooked food under the stars. It was great. One of things I wasn't looking forward to about moving back to the midwest is the lack of beautiful campsites nearby. There are a few cool places in Indiana and Starved Rock in Illinois, but the really desolated and beautiful campsites are pretty far away. As you can imagine, we plotted out a couple of weekends that may have worked for a camping trip but nothing ever panned out. Now, we have to wait about 8 months for our next warm weather opportunity. 2) Go to a Cubs game. Matt, being a hoosier and all, has never attended a Cubs game. I have explained to him numerous time how being at Wrigley field is nothing like watching it on TV. It's a whole experience. I really wanted to go on a beautiful summer day where we could enjoy a beer and the friendly confines. 3) Canoe down the Chicago River. The river can be a scary place - it's not my first choice of bodies of water to get wet by. However, I have always wanted to rent a canoe and paddle down to Life's Too Short, dock my boat and get a beer. 4) Go to the Botanical Gardens. I haven't been there in ages and I love the Japanese gardens. 5) Have or go to a "successful" BBQ. During both BBQ's Matt and I had, it rained. We were stuck inside or on our back porch. Although, both events were fun, I wouldn't call them a "successful" BBQ due to the fact that we had to eat inside. No one else we knew had a BBQ this summer. What's up with that? 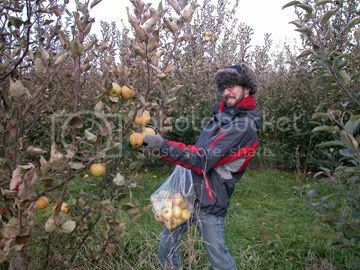 Now, the only thing I really, REALLY want to do before it gets cold and there are no more apples to pick is well, go apple picking. The next time Matt and I have free happens to be October 15th. Will there still be apples?!?!? I don't know. If anyone is free that day and you want to join us, let me know. I guess I'll have to put these things at the top of my list for next year. Next year - can you believe it is only 3 months away?!?! ?